To get started with the Registration Form setup process you will firstly need to add a new form. This can be done at Club and Association level from within your Membership Database. Please Note: For some sports, you are not able to Add a form, only Edit an existing form. To Add a new Registration Form, select the Registration Forms option, found under the Registrations tab in your Membership Database. From within this screen, select the green Add New Form button. When creating a new registration form, there are 6 tabs across the top that will assist you in this process. The first tab is Settings. This will allow you to choose some basic Registration Form framework. Payment is Compulsory: When this option is selected and there is at least one mandatory product, registrants must also pay online at the time of registration in order to complete the registration. Allow Member to Register as: This will allow members to register as either a Player, Coach, Match Official, Volunteer, Official or Misc. When a member registers as e.g. ‘Coach’, they will be assigned as a coach in your database. Allow multiple registration: This will allow multiple members to be registered in the same session which is particularly handy for registering a family. 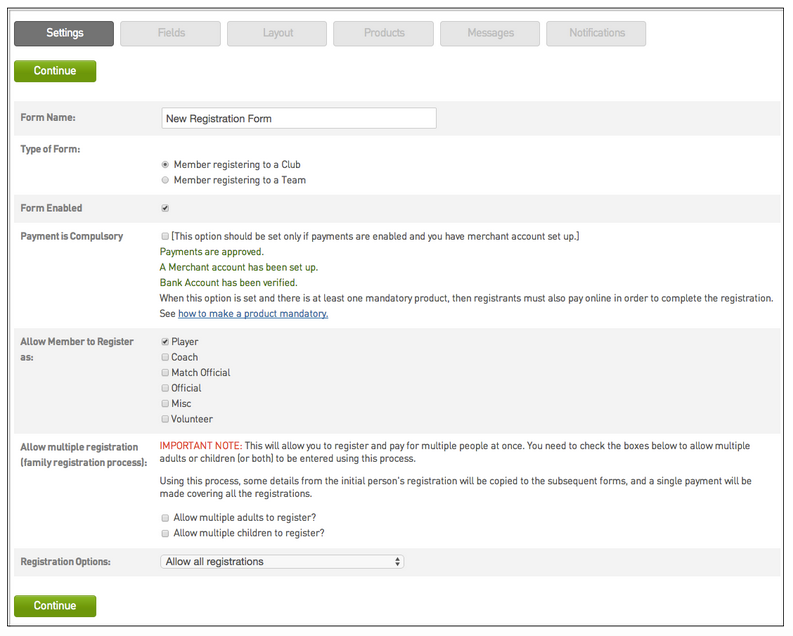 The Fields Tab will allow you to add what fields, or questions display on your Registration Form. This can be in the form of Hidden, Read Only, Editable, Compulsory or Add Only (Compulsory). Note: Fields are hierarchical, meaning if a level above your organisation e.g. National Body, State, Zone, Association has set a Field as Editable or Compulsory, it cannot be removed from your Registration Form and must be answered by participants. 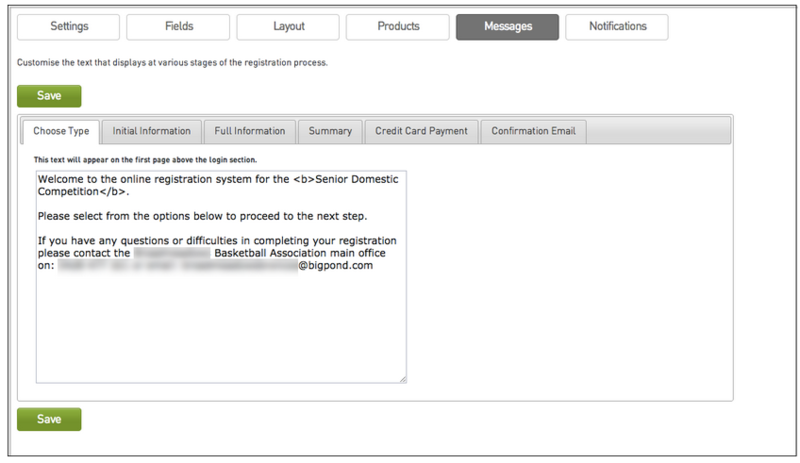 The Layout Tab will allow you to configure the order in which your fields will display on your registration form. To arrange where a field displays on the registration form, click and drag the field and drop it to move it into a position on the form. It will save automatically. Enter your Block Label and Content. The Label will be the the Label of the Header in the Layout Tab and the Content will be what displays on your registration form. Below is an example that will display: “This will be your heading”. Choose either a gender or an age group as a rule and click save. The Products Tab will allow you to link previously created products to your registration form. Any products that you tick in the ‘Active’ column highlighted below will display on your registration form. The Mandatory option will set the product as pre-selected for the member accessing the Registration Form and is best used in conjunction with Compulsory Payments and Product Filters. 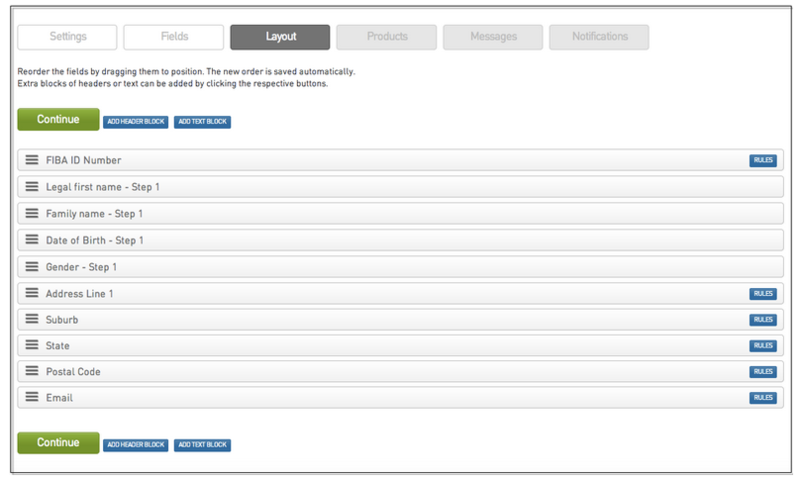 You are also able to set a product Sequence, by entering a number into the box e.g. 1,2,3,4. For information on Creating a Product, please see our Create a Product article. 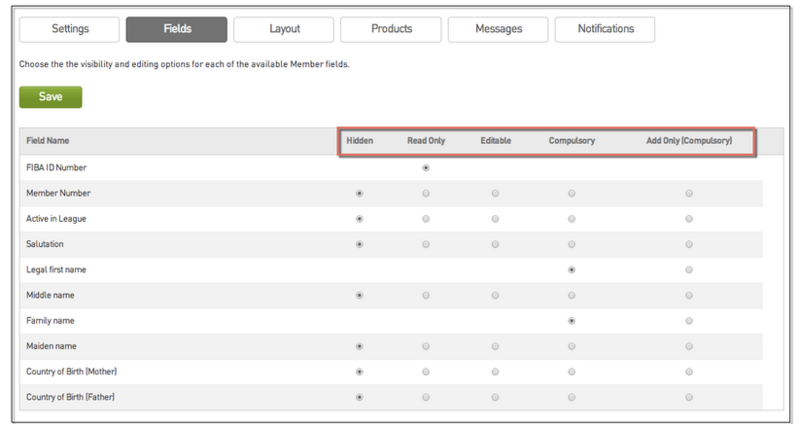 The Messages Tab allows you to add blocks of text throughout the registration form process, to act as a guide for your members completing the form. The Bold text will describe where your message will appear on the Registration Form. The Notifications Tab allows you to choose who should receive emails following a completed registration. Ensure Organisation Contacts have been entered ensuring that the email is received as intended. For information on entering Contacts, please see our Contacts article. Do you need more advice? See 'Related Articles' or submit a support request.